I consider myself to be a dreamer, and I find myself drawn to others of like mind. I realize that to many, the label “dreamer” is considered to be an insult, meaning that one makes unachievable and fanciful plans that fly in the face of “reality” at the expense of using their time and energy on more practical pursuits. In this context, “reality” is used as another word for limitations. I am not trying to say there are no limitations, because clearly there are. Rather, I think the limits we perceive are not where we think they are, they are mirages of barriers that may be somewhere over the horizon. Limitations need to be challenged. Barriers must be tested. Like most things, dreams come in various sizes and shapes. Some dream of solving the problems and puzzles that confront humanity, while some dream of simpler things that are more personal. While I appreciate the big dreamers and am grateful for the fruits of their dreams, I feel more of a kinship with the “day dreamers”. I remember a study I learned about in Psych 101. As I recall, in this study there were two sets of subjects. They subjected both groups to an increasing level of pain, supplied by an electric shock. The subjects were instructed to continuously rate their level of pain. One group had a big red button in front of them. This group was told that they could press the button at any time and the pain would stop. The button, in fact, was connected to nothing but the test subjects did not know that. The other group had no button and was told they had no control over the pain. Both groups received identical electric shocks, which gradually increased in severity. The group that thought they could make the pain stop whenever they chose to, rated their level of pain as being significantly less than the level reported by the group that thought they had no control. I think our dreams serve the same purpose as that red button, they offer a way out. Whether or not we push the button is up to us. It takes courage to dream, in addition to exposing yourself to ridicule and sideways glances, many fear that allowing yourself to dream can expose you to regrets if the dreams go unfulfilled. What true dreamers know, however, is to just have the dream is liberating. The pursuit of the dream may never be necessary. It is only required that the dreamer intends to pursue the dream “someday”. The mere existence of the dream has a healing effect on the life of the dreamer. It is the concept of the dream that can keep us alive. This painting was inspired by something I saw while wandering the country roads in east central Illinois. I stumbled upon a scene very similar to what is depicted in this painting. 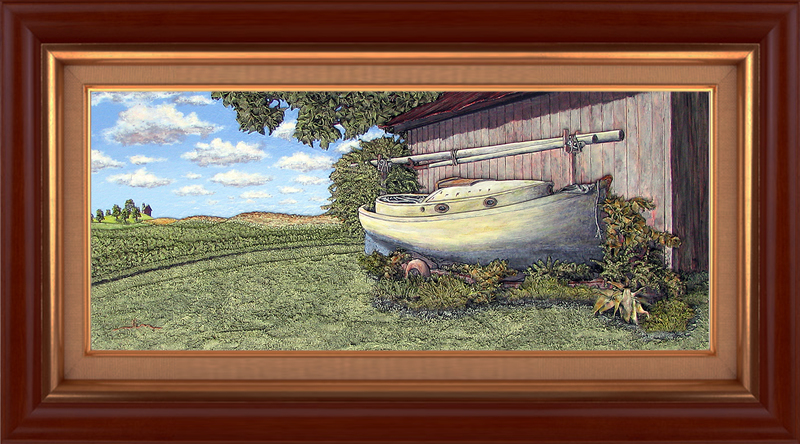 There was an old and neglected sailboat on a rusted trailer parked next to a dilapidated barn; weeds and grass were growing around and through the trailer and boat. The boat was in a condition of general disrepair. Birds and critters of all descriptions had set up housekeeping in the boat. It was a veritable “Barnyard Ark”. It was obvious that the boat had not been moved or received any attention for quite some time. I wondered what circumstances caused this vessel, clearly intended for open water, to be abandoned next to a barn in the middle of an ocean of corn and soybeans. I imagined it must have been placed there by a fellow dreamer, one that intended to repair it and use it someday as a gateway to maritime adventure. I hoped that the dream was still alive. I was going to title this piece “Someday”, but in the end, I decided to base the title on a quote that I love from “Eleonora”, a short story by Edgar Allen Poe.